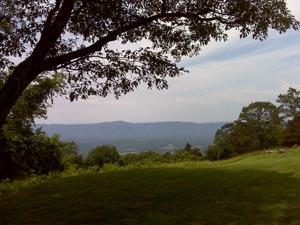 Blue Ridge Pkwy Shenandoah Valley on one side of the road, the Piedmont Plateau on the other. You're riding a ridgeline, a narrow road opens its views. You're in the Appalachian Mountains in Virginia. Awesome. As you ride south with your head twisting left and right to catch the views, you cross I-64 and leave the national park. That was Skyline Drive. But the adventure doesn't end there. The road's name becomes Blue Ridge Parkway and your vistas continue. Lakes, rivers, waterfalls all the way into North Carolina. about 400 miles from one end to the other. Deer, bear, birds and other critters are all over the place. You meet backpackers hiking the Appalachian Trail and the rest areas. Don't worry about gas and food, they're available. 4 CA Yosemite Any road! 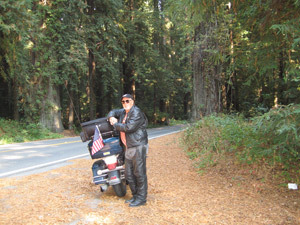 My friend Manny and I came in from Fresno on CA-41 and wound our way down the hill, through the tunnel and came upon one of the most spectacular views in the world. 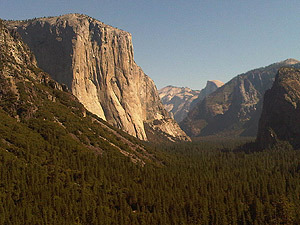 There before us was an expansive view of El Capitan and Half Dome along with the many other rock features. The whole valley spread out in front of us. 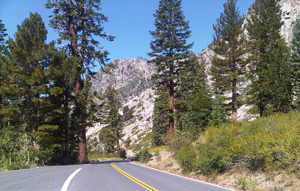 We rode into the valley past waterfalls and rivers, then back up the other side and over Tioga Pass. Must do, must do! gas available in a couple of locations--plan ahead. Food in Yosemite Village. Scotia to Garberville Ever want to feel small and insignificant? This is the place! Old 101 parallels the new 4-laner but is in a whole other world. It's the "Avenue of the Giants." I'm a believer in the "loud pipes save lives" theory but I felt guilty rumbling through this redwood forest with its trees that are hundreds of years old. Stop, shut the bike down and listen to the silence. It's spiritual, awe-inspiring and magnificent. Skip rocks on the Eel River and watch the blue jays and other birds soaring overhead. Walk down a trail and smell the wood. No problem here with fuel or food. SR-296 to Red Lodge, MT Beartooth Highway, across Beartooth Pass through the Beartooth Mountains. Great ride. Great feeling. 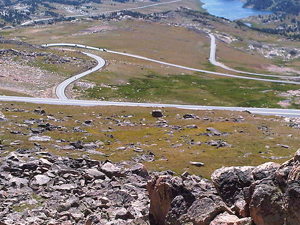 Even though the road switchbacks up to nearly 11,000', it's open and non-threatening. Dangerous, yes, but you feel more confident here than on other twisty roads up steep mountains. Views are spectacular. Gas is limited, there's a store at the top of the first climb and vending machines at a rest stop/vista point on the down side, but plan your trip and your fuel stops. Jamestown Combine Mt. Evans, Beartooth, Tail of the Dragon and a couple of other of my favorites and you get 108. This is a scenic route with twists and turns that climb to the sky. Just after Manny and I turned off 395 he spotted a sign that announces 26 miles of curves. I saw a sign that announced 26% grade. It was all of that. (In case you don't know how grade is measured--26 means for every 100 feet you go forward you go up 26. Most roads you ride or drive are around 6-7%!). So we climbed and twisted through the Sierra Nevadas. It was 82 miles from the turnoff to the first town, Sonora. Once we'd cleared Sonora Pass at about 9,600', we dropped down an equally steep road through some of the most beautiful country I've ever seen. What sets this road apart from all the others is traffic--there was none. No bicycles, no trucks, no RVs, no campers. Just a few cars. We went through on a late summer Tuesday, so it may be more heavily traveled on weekends. Plan your gas and food--ain't nuttin' 'tween Bridgeport and Sonora (except a little place called Strawberry). Just a few campgrounds. This road is not for beginners or the faint of heart. Feel free to e-mail me your favorite road(s) if you don't find it/them here.